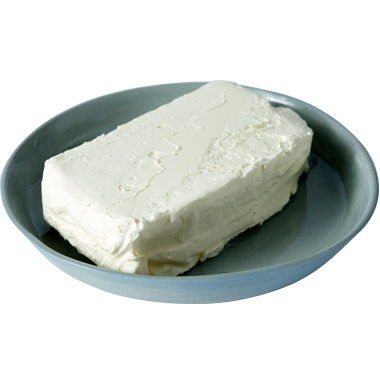 For most Americans, cream cheese means cheese wrapped in foil or found in a plastic tub. We’re here to tell you that there’s a lot more to this soft, mild and infinitely spreadable cheese. Cream cheese became popular in the late 1800s, when production in the Northeast spread throughout the country thanks to the invention of the separator. The separator allowed cheesemakers to pack curd hot and double shelf life. We’re stumped as to why cream cheese is often marketed as neufchatel, since it bears no resemblance to that soft-ripened Normandy cheese. Whatever you call it, our bagels would go into mourning without it. With relatively high moisture and milkfat content, cream cheese blends and works with loads of different flavors making it an ideal base for spreads and dips. It’s much easier to cut and wrap when it’s chilled. Pro tip: Score the cheese’s plastic or aluminum wrapper with a sharp knife and slice it with wire or fishing line. We like our cream cheese with just about any beverage. Ones that seem to pair the best with it, however, are ciders, fruit beers and weiss beer. Wines that pair nicely include chianti, chardonnay and riesling.